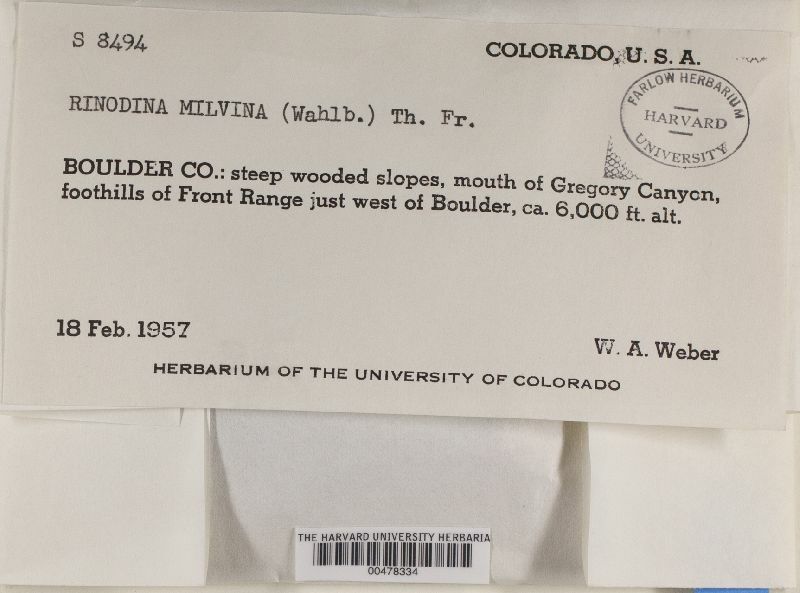 Rinodina milvina (Wahlenb.) Th. Fr. Thallus: crustose, of discrete, small verrucae at first, up to c. 0.2 mm wide, thick and areolate when mature, areoles up to 0.5-1 mm wide, plane or more usually rugose surface: gray-brown to dark brown, dull; margin: determinate; prothallus: sometimes present, black, entire or fimbriate; vegetative propagules: absent Apothecia: frequent, subinnate becoming adnate, contiguous, sometimes angular by compression, up to 0.3-0.8 mm in diam. disc: dark brown to black, persistently plane thalline margin: concolorous with thallus, 0.05-0.1 mm wide, entire, persistent; excipular ring: absent thalline exciple: 60-100 µm wide laterally; cortex: 10-15 µm wide; cells: up to 4.5-7 µm wide, pigmented; algal cells: up to 9-17 µm in diam. ; thalline exciple 50-90(-140) µm below; cortex: 10-25 µm wide, cellular, often pigmented proper exciple: hyaline, 5-20 µm wide laterally, expanding to 10-40 µm at periphery hymenium: 65-120 µm tall, paraphyses: 1.5-2.5 µm wide, not conglutinate, with apices up to 3.5-5.5 µm, lightly pigmented but immersed in dispersed pigment, forming a red-brown epihymenium; hypothecium: hyaline, (30-)55-100 µm thick asci: clavate, 40-70 x 15-23 µm, 8-spored ascospores: brown, 1-septate, broadly ellipsoid, type A development, Milvina-type, (15-)18.5-19.5(-23) x (8-)10.5-11(-13.5) µm, lumina angular at first, quickly becoming irregular with broad or poorly developed canals, then rounded and almost filling each cell, endospore wall sometimes pigmented in part, resulting in lightly pigmented bands around cells of some spores, mature spores constricted at septum; torus: well developed; walls: ornamented (Fig. 63) Pycnidia: immersed; conidia: bacilliform, 4-5 x 1.5 µm Spot tests: all negative Secondary metabolites: none detected. Substrate and ecology: on acidic and weakly alkaline rocks, and sometimes epiphytic on other crustose lichens, at elevations of 900-3660 m in North America World distribution: Scandinavia and mountains of central and southern Europe, North Africa, Asia and western United States Sonoran distribution: Arizona and a single record from San Bernadino County, California, at 1700-3000 m. Notes: Rinodina milvina is a rather variable species with respect to spore structure and size, and thallus morphology but is unlikely to be mistaken for other species in the Sonoran region. Young thalli may have a similar habit to R. parasitica that also are dark brown but this species is easily distinguished by its smaller, Physcia-type spores. Well developed, thick thalli, usually with a rugose surface, have a tendency for areoles to proliferate marginally and overgrow older areoles. Californian records of R. tephraspis (Tuck.) Herre (Herre 1910) belong to R. milvina.